1. I won the lottery so I only had to pay $25 for a front row seat. 2. The "Man in the Chair" was mildly funny. 3. Beth Leavel was mildly funny. 4. Sutton Foster had some good moments. 5. The costumes were flashy. 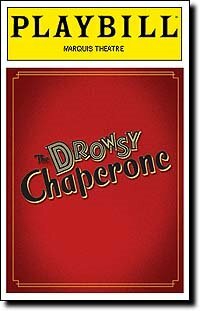 The Drowsy Chaperone earned a baker's dozen of Tony nominations this year. Why? I think it is due to a sheer lack of competition from the limited field of original shows this season. "The Man in the Chair" spends the time breaking the fourth wall by trying to justify to the audience why he loves the recording of the (fictional) 1928 musical The Drowsy Chaperone. He plays a vinyl record of the show on a turntable and his story begins. The show is then acted out in his living room, which I found the only element original and imaginative. However, he spends the time apologizing for "stupid" or "bad" scenes and lyrics, trying to sum it up by an "it doesn't matter" attitude "because it's the way it makes you feel". I found it to be a tongue-in-cheek attempt at poking fun at the musical theatre genre and those who truly are devoted to it. It was not without funny moments - when the the record would skip, the cast and music would also "skip"; the leading lady's voice was still heard singing a line while she was drinking a glass of water; etc. The costumes were fabulously flashy and the set was interesting, but I found the cast to only be so-so. I expected to be blown away by Sutton Foster, Tony nominated for this leading lady role. I missed her Tony-winning performance in Thoroughly Modern Millie, but I did see her extremely underwhelming turn as Jo in Little Women, for which she was also nominated. I wanted her to prove to me that she is indeed a triple threat. I have high expectations of her and I want her to remind me of Angela Lansbury or Julie Andrews, but she just falls short. Sure, her voice is terrific, she can act and she can dance, but she just isn't commanding and she lacks sparkle. Of course she has triple talent, but is she triple threat? I think not. Yet, as a friend pointed out, she is reminiscent of the old days - since her debut, she has managed to come out every season with a Tony nomination. We'll see - maybe she just needs a truly break-out role. The best part of the show was seeing the wonderfully campy Beth Leavel nail the boozy diva role, also Tony nominated this year. She was funnier and better than the entire cast put together, which frankly isn't saying much. So, am I glad I saw it? Well, I only paid $25 for a front row seat and I didn't have any other plans on a rainy Thursday night in NYC. I will also be able to be a better judge if it takes sweeps the Tonys this Sunday.